While the thought of traveling with your young kids may feel overwhelming, it is often one of the most memorable experiences you'll have as a family. Relax and let Backroads take care of all the details while you sit back, enjoy priceless time away together and see the world through new eyes. Backroads has designed Family Trips for Kids 4 to 8. For safety reasons, kids need to be at least 7 years old (9 years old in some cases) to ride their own bike. Kids younger than 7 can accompany an adult riding a bicycle with a Trailer Bike or Trailer Carrier. See below for details on each trip. Trying to decide between a domestic trip vs an international trip? A trip in North America is a great first Backroads experience for families with younger kids. There's often less travel time, less jet lag and the culture and cuisine tend to be more familiar. If you are choosing between a Hotel or Camping Trip, Hotel Trips have more structure to breakfasts and dinners and provide the space for more quiet time away from the group. Camping Trips are located in places that inspire a spectacular connection to nature and wildlife, and offer more freedom—you can kick back while your kids are out playing with new friends. Wondering what activities are the best fit for your family? Our Multi-Adventures offer a variety of activities and every day is a different adventure. If you're not sure your kids are going to like riding a bike every day, as we do on Biking Trips, a Multi-Adventure is a great choice. So that both you and your kids are comfortable, we recommend getting out prior to your trip to ride bikes or hike together, and ride a bike with a trailer or trailer bike if you are going to use these on your Backroads trip. Knowing what to expect will make a huge difference in the fun factor for all of you. Do kids need technical clothes or gear for biking or hiking? Kids this age don't need padded bike shorts; they'll be comfortable in regular active clothing. Be sure everyone has a good pair of walking shoes. We'll give you a packing list after signing up so you can pack like a pro. Do Backroads Trips offer routes suitable for everyone in the family? Our Family Trips for Younger Kids are designed with families in mind an offer kid appropriate routes and activities as well as longer options for adults while kids are in the company of our Kids Activity Expert. Some trips have age-restricted activities that are often less than half a day and can be opted out of easily without impacting the enjoyment of the trip. You'll find a list of all the kid-specific equipment availability and activity-specific age restrictions below. We want to help you choose the perfect Backroads trip for your family. Check out our Frequently Asked Questions. For more details and to find trips with families that have kids of similar age(s) as yours, call us at 800-462-2848. Switzerland Multi-Adventure — Teens & Kids, Premiere 7+ ropes course: min height is 4'7"
Switzerland Multi-Adventure — Younger Kids, Premiere 7+ ropes course: min height is 4'7"
Our Trip Consultants will gladly answer any questions you may have. Call us at 800-462-2848 to discuss your trip of interest today. On all Backroads Family Trips, you'll find 20" and 24" bicycles for the younger set. They say good things come in small packages; when it comes to bikes for kids of all ages, Backroads is the expert. 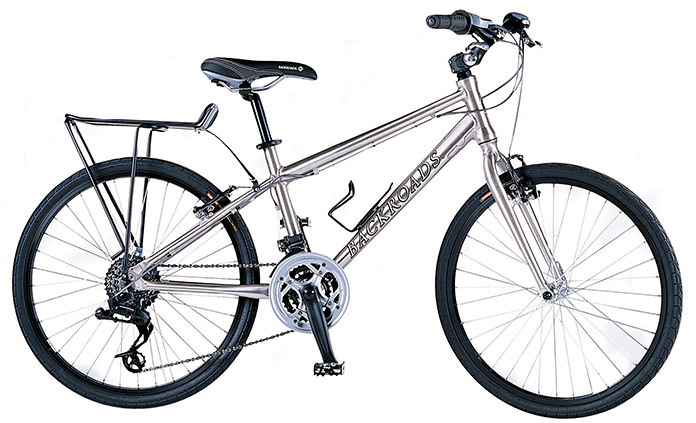 View full bike specifications. 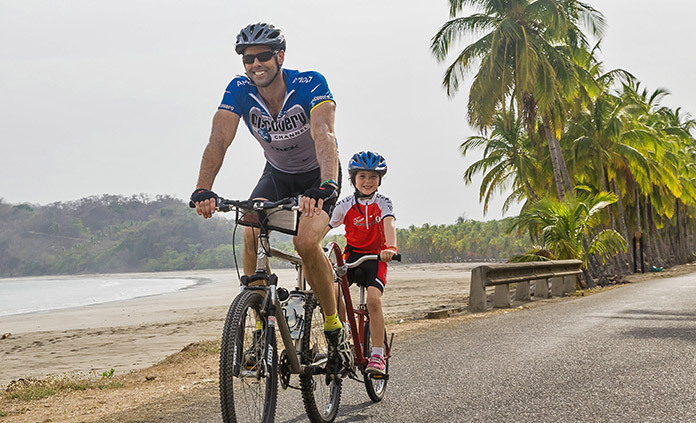 Backroads is the only travel company to manufacture its own line of Kids' Bikes. While the wheels might be small, the performance is big—it's the perfect choice for kids. In general, we find that four- through eight-year-olds are suited to riding the trailer bike. 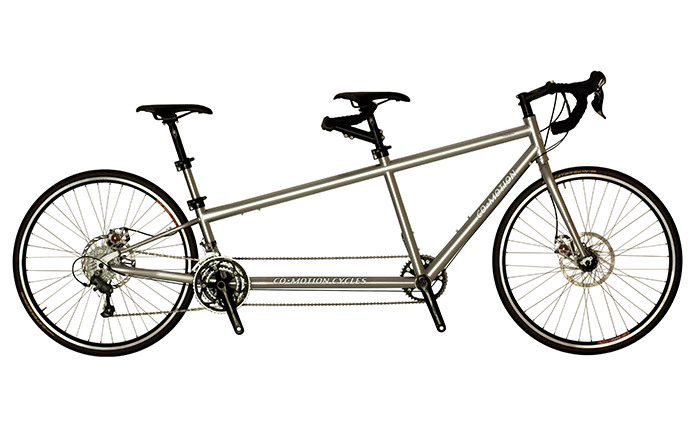 Parents experienced in riding a tandem may choose to upgrade to the Co-Motion Torpedo tandem to ride with one of their kids. It's a great choice if your child is not quite ready for bike touring on his or her own. You'll be in the driver's seat and can help to provide some motivation. $400 rental price. See more details. 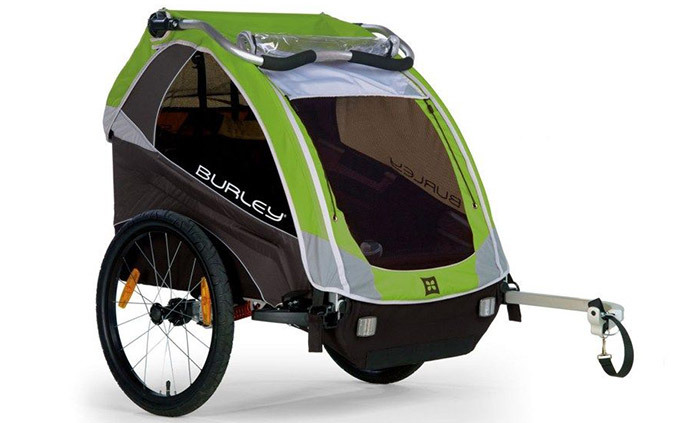 The Burley Cub trailer, for one or two children 60 pounds and under, is a sturdy carrier that attaches to our bikes. It provides a comfortable and safe ride in the spacious interior with inner pockets for snacks and drinks, a reclining seat with a secure five point padded harness system and an adjustable sunscreen. In general, we find that four+-year-olds are well suited for riding in the trailer carrier. 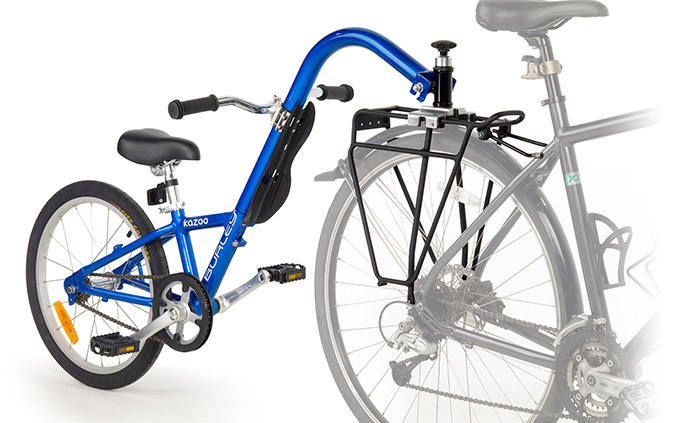 See adult bike options and upgrades, including Specialized pro-level bikes and eBikes.